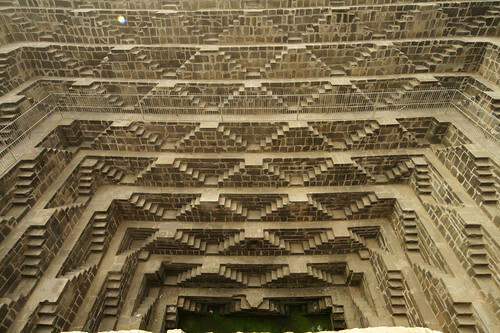 Stepwell are wells or deep ponds in which the water is reached by descending a set of steps. Stepwells were at one time quite common in North-West India ( Rajasthan and Gujarat) and adjoining areas of Pakistan where water is scarce. Although the main purpose of these stepwells was easy access to water, however some the wells also had multilevel rooms, usually going right up to the bottom of the well, to provide relief to the rich and royals from daytime heat and these rooms and the associated buildings were provided with significant architectural decorations. 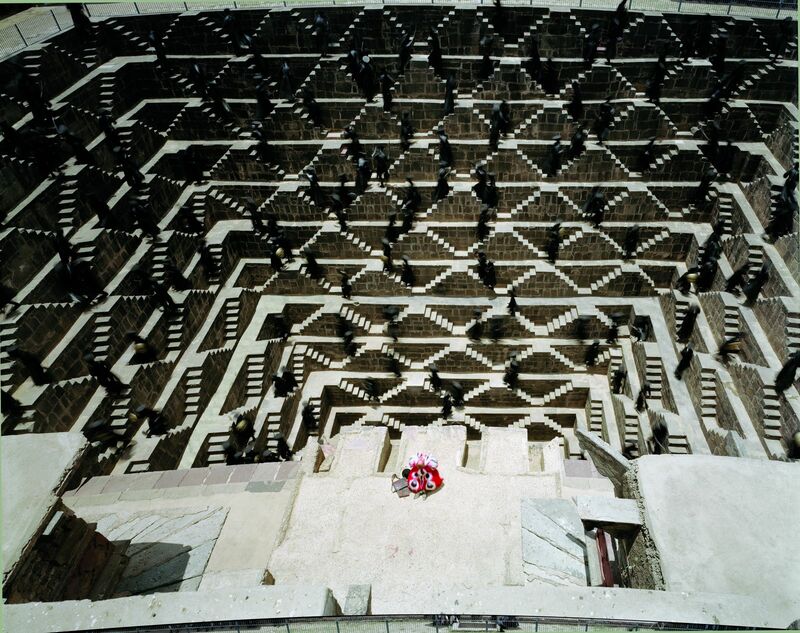 One of the most intricate, deepest and largest stepwell in India, called Chand Baori (or Baoli/Baodi meaning stepwell), is located in the village of Abhaneri near Bandikui, Rajasthan. Unfortunately many tourist who visit Jaipur and Agra are unaware of it or do not visit this intricate stepwell, although it is just 95 kms from Jaipur and about 8 kms off the main Jaipur-Agra Highway. Even in India not many are aware of this architectural marvel. Built in 10th century the well is 30 meters deep, has 13 landings and 3,500 steps. The unusual and intricate pattern of steps allows simultaneous easy access to large number of persons to the water. Abhaneri stepwell was locale of 2005 Indian movie "Paheli" (meaning Puzzle) and also for 2006 English movie "The Fall". This image from the movie "The Fall" shows a remarkable view of the steps. Great info on the Well. More like a Reservoir or Summer escape place. You are a great resource for such unique destinations. I will gladly take my clients there when I bring them to India next year. WOW...i was Delhi for so many years and was not aware of this, else would have gone there. Thank you Sapana for your comments. My apologies for belated reply. I had missed reading your comments. Lately I have not been very active in this blog but I assure you and my other readers I will be posting more stories here.